Chicago residents, frustrated with the slow progress in getting leaking fire hydrants repaired in their neighborhoods, have taken on the repairs themselves. 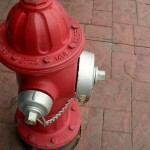 In an attempt to stop, or at least slow, water leaking from malfunctioning hydrants, are wrapping them with duct tape. Click here to buy RED duct tape.